Two discuss developments in Syria, efforts to counter Iranian aggression. 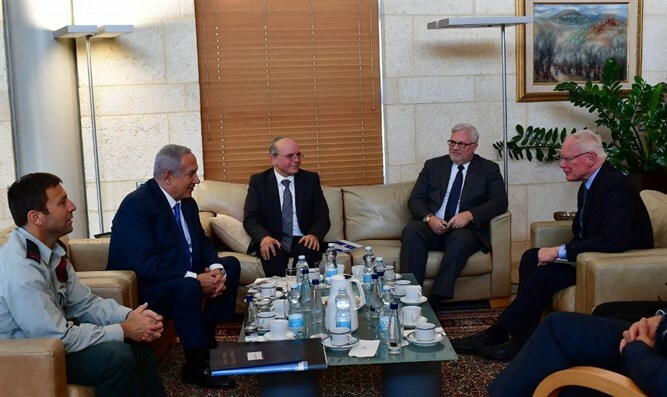 Prime Minister Binyamin Netanyahu met today with U.S. Special Representative for Syria Engagement James Jeffrey in Jerusalem. The two discussed developments in Syria and efforts against Iranian aggression. Prime Minister Netanyahu thanked Special Representative Jeffrey for his efforts and congratulated President Trump upon the Iran sanctions entering into force. The two met two months ago after the State Department said they would discuss "maintaining Israel's security while countering Iran's destabilizing activity throughout the region". The two also addressed "Russia's specious allegations of international plans to stage a chemical weapons attack in Syria" in meetings across the region, according to the State Department.